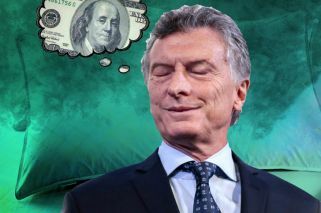 If Cristina’s cronies really did bury containers stuffed with paper money in remote Patagonian farmsteads, they will have been full of dollars, euros, Swiss francs, pounds sterling, yuans and yens, not pesos. Since it first appeared on the scene in the early 19th century, the Argentine peso has dwindled to less than a trillionth of its original size. Hardly a day passes without it getting even smaller. In the same period, the US dollar also lost a large chunk of its value – in 1820, one would buy you what you could get with about 20 today – but in comparison with the peso, the greenback looks rock-solid. Unsurprisingly, an overwhelming majority of Argentines much prefer them to pesos; as economists ruefully point out, theirs has long been a “bimonetary” country in which the local currency is used for minor everyday transactions and all serious business is done in US dollars. That is why, yet again, some influential people both here and abroad are saying that Argentina ought to go the whole hog and scrap the peso once and for all; the new banknotes may be pretty enough, but nobody in his or her right senses would dream of hoarding them. If Cristina Fernández de Kirchner’s cronies really did bury containers stuffed with paper money in remote Patagonian farmsteads, they will have been full of dollars, euros, Swiss francs, pounds sterling, yuans and yens, not pesos. Full-blooded dollarisation was last on the cards when Domingo Cavallo’s currencyboard arrangement broke down in the dying days of 2001 and legislators gleefully voted to strike a blow on behalf of sovereignty, national dignity and other splendid things by defaulting on the country’s US$95-billion foreign debt. Though spokesmen for Mauricio Macri’s government swear that it would never dream of resurrecting convertibility, with the peso rapidly shrinking as it has been of late the idea that dollarisation might be the answer to Argentina’s chronic currency woes has returned. One of Donald Trump’s key economic advisors, Larry Kudlow, is very much in favour of it; apparently, neither the US Treasury Department nor the International Monetary Fund would object that much. The government’s unwillingness to commit itself to dollarisation or anything like it is understandable. In the months that followed the great crash of 2001 and 2002, politicians agreed that convertibility, which until then most had supported, as had much of the rest of the country, had been a terrible idea. The new consensus was that never again should a government be allowed to nail the national currency to a much stronger foreign one because it would be ridiculous to expect the economy to thrive while wearing such a straitjacket. The same arguments that were heard back then are being made today as politicians and economists warn us that too much rigidity can have even worse consequences than has the monetary indiscipline which for a century or so has been one of Argentina’s defining characteristics. In theory, the many who say such things are right. If so inclined, they can also point to what has been happening in Greece and Italy after they adopted the euro, which, as expected, turned out to be a slightly flabbier version of the Germany’s muscle-bound Deutschmark. Even so, the dilemmas facing not just the present government but also the political elite as a whole are less simple than most would like to believe. It is all very well to say that – instead of outsourcing monetary policy to Washington – the government should learn to manage the national currency in a responsible fashion, but so far all its efforts to do so have failed for the usual political reasons. It would be comforting to think that the spectacular end suffered by Cavallo’s currency-board strategy merely meant that it was foolish to suppose that Argentina’s economy would be capable of shadowing that of a big, highly productive powerhouse such as the United States, but that is a red herring. Small countries, among them Switzerland, have currencies which over the years have proved to be every bit as strong as those of far bigger ones. The downfall of convertibility reminded us that, for reasons which for the best part of a century have been perfectly obvious, Argentina finds it desperately hard to live for long with a stable currency. Inflationary pressures soon become too strong for any government to resist. For much of the final decade of the second millennium, Carlos Menem’s government and – for a short while – the one headed by Fernando de la Rúa, got round this by borrowing money, which they, and many businessmen, found easy enough to do because there was plenty lying about and the word had got round that at long last Argentina had stumbled on stability, but then the entire Ponzi scheme collapsed, with devastating effects for much of the population though not, as it happened, for many members of the political elite. Those who are dead against dollarisation say that the country, by which they mean the government, should learn to handle the peso in such a way that it keeps its value for rather longer than has always been the case. In other words, it should behave as though the dollar or something equally strong were the national currency, the only difference being the name given to it. 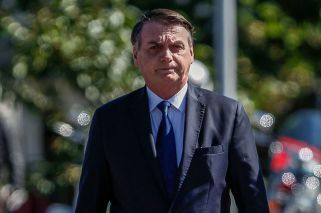 However, were Macri or one of his successors to do what is being demanded of them, all the unpleasant things that politicians and economists have taken to warning us against would then come to pass. Convertibility of dollarisation would certainly reduce the number of options available to whoever is in power, but so too would a genuine commitment to defending the value of the peso. Unfortunately, dollarisation would not be a quick fix. The country’s many structural problems have less to do with the natural desire of many to continue to have a sovereign, independent and suitably patriotic monetary unit than with its evident inability to live within its collective means. There is no easy way out of this. Though convertibility halted inflation for a while and tempted many investors to come in and try their luck, which brought many lasting benefits, neither politicians nor prominent businessmen fully adapted themselves to the situation thus produced. Instead, they went on much as before, spending far more money, especially the large sums many found themselves able to borrow, than was wise. That was why convertibility came a cropper.